Autumn Beach Spots We’ve FALLen For! Now don’t get us wrong, the last thing we want to do is wish our summer away. But here at dealchecker we like to be one step ahead of the game, which is why our minds are already on autumn holidays. Sure, there’s plenty to choose from, but what we’re after are gorgeous beaches with some extra sunshine thrown in to soothe those post-summer blues. Here are the destinations taking our fancy this year! Famous for its warm waters until Christmas time, the small Greek island of Symi is a great choice for anyone looking for an autumn break. Just a short boat ride from Rhodes, people come for the stunning beaches alone. Mainly small coves dotted across the island, Symi's beaches benefit from shade and seclusion, as well as some pretty beautiful surroundings. Agios Nikolaos beach is one of the most popular picks, however with comfortable temperatures in the mid to high 20°Cs, exploring the other sandy spots should be a breeze. All year round sunshine and coastal winds are just two of the many things that make the Canary Islands, including Fuerteventura, just so special. Visitors can expect balmy mid 20°Cs during their autumn visit here, while the rest of us back in the UK are shivering our socks off! 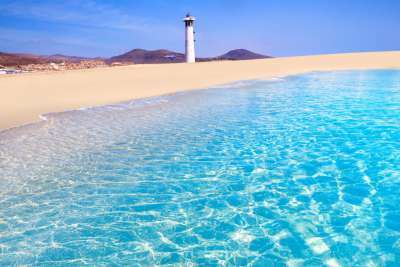 Fuerteventura has a fantastic choice of beaches on offer to soak up those late rays. From Caleta de Fuste with its golden sands and relaxed vibes, to Sotavento Beach which is great for wind and kite surfing. 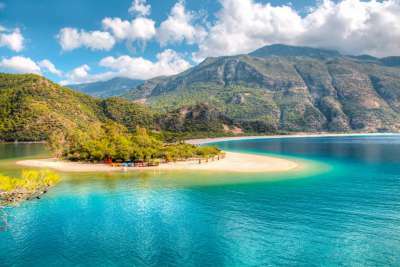 For many, the months of September and October are the best time to visit the region of Dalaman in Turkey. With soaring temperatures throughout the summer months, autumn brings a much more bearable climate making beach-based sunbathing much more fun. The beaches in Ölü Deniz are gorgeous, but can get rather busy at times. If that's the case then you can always head a few miles away to Kabak with a sandy setting next to a densely wooded valley for ultimate privacy - Bliss! Although not the hottest on this list, Valencia in the autumn shouldn't be dismissed. 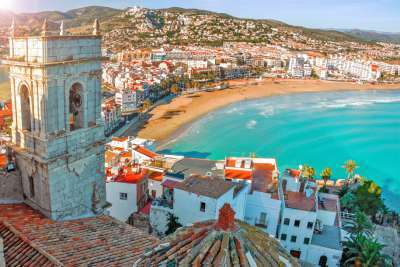 Still warmer than home, and with definite sun-soaking opportunities, this Spanish city has lots to offer holidaymakers. The main beach is just 15 minutes from the city centre, and there are many others preserved in their natural state, surrounded by sand dunes, just a short drive away. If the weather turns a little chilly, you always have the historic centre and a world-class paella to fall back on, so it's not all bad. 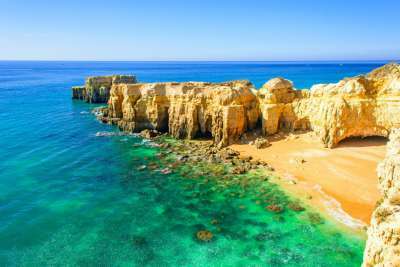 Packed with truly stunning beaches, the Algarve really is one of the very best when it comes to golden sands and crystal waters. Thank goodness that it's also a great choice for some autumn rays! Escape the crowds and intense heat and visit in the fall instead for some enjoyable temperatures and a guaranteed sun lounger. Praia da Marinha is one of our favourite spots with photogenic limestone rock stacks and gorgeous golden colours. Make sure you check this one out! Located just off the toe of Italy's boot, is glorious Sicily. This is the largest island in the Med, yet so many don't even consider it when deciding on a holiday. 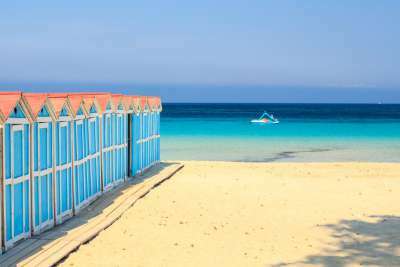 With temperatures reaching up to 26°C during the autumn months and some of Italy's best beaches, it's well worth a thought. Cefalù is great for families with soft, golden sands and backed by dramatic, craggy cliffs. There's also Scala dei Turchi which is fantastic for surrounding scenery, and Isola Bella which is a top spot for snorkelling, to name just a few. With temperatures still firmly in their mid 20°Cs, visiting Malta after the summer crowds have gone is certainly a good idea - especially for the beach-goers out there! Ghajn Tuffieha is one of our favourites with a narrow stretch of red sand, set away from roads and modern construction, and despite being a Blue Flag beach, it remains rather quiet. St George’s Bay is a slightly lively spot, but with the resort areas of St Julian's and the capital Valletta nearby, there are plenty of other options when you need a break from all that sunbathing. Being Greece's largest island, Crete sees visitors all year round. However, it is the autumn months that are favourable due to its cooler, but still warm weather, and less hoards of people. Not to mention the cheaper prices! Like all Greek Islands, the beaches here are gorgeous. Váï beach is known for its exotic Caribbean vibes, Soúgia for its twisty but scenic inward journey, and Elafonísi for its pale pink sands, but there are plenty of others also worth exploring. With warm waters heated from the summer months, and a toasty autumn climate, Agadir in Morocco is a great destination for some late sunshine. Head there and enjoy up to 11 hours of glorious rays each day and a long, wide beach to enjoy them on. As well as soaking up the sun, visitors can also get involved in a range of watersports off Agadir's main beach. After you're all sunned out, head into the centre for some delicious traditional delicacies, and a bit of shopping. 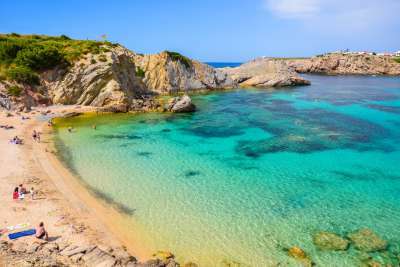 Often overlooked, Majorca's little sister Menorca has a lot to offer tourists, with some of the top beaches in the Med. Benefiting from low to mid 20°Cs in the autumn months, visitors can enjoy these beaches at a more bearable temperature, and with fewer people around! 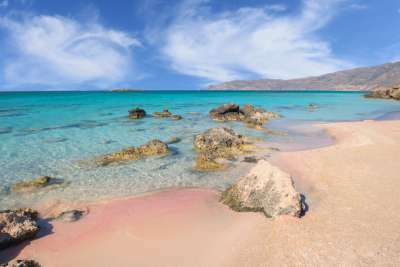 Cala Pregonda is a long beach with reddish sands and pink rocks and is a pretty little spot to visit. There's also Cala Macarella, the island's most famous bay, and Son Bou, one of the livelier beaches.